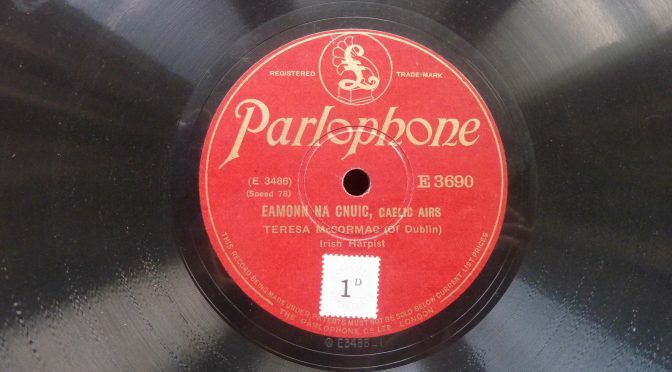 I found a shellac 78 disc of Irish harp played by Treasa Ní Chormaic. I don’t know the date of this disc. I have transferred both sides onto mp3 for you, using a modern turntable. When I suggested to the committee of the Friends of Wighton back in the spring, that I could do a gramophone session for one of the regular Wednesday lunchtime concerts in the Wighton Centre in Dundee, I just thought it would be a bit of light-hearted fun, but actually it has become quite a serious task for me! From planning the sides and running order I’ll play, to opening and cleaning and oiling the machine, to reading up on the music so as to have something useful to say during the presentation, it is taking up a lot more time than I expected. I have been reading some interesting books or at least sections of books. In Scottish Life and Society, A Compendium of Scottish Ethnology, volume 10: Oral Literature and Performance Culture edited by John Beech, Owen Hand, Fiona MacDonald, Mark A. Mulhern and Jeremy Weston, (John Donald in association with the European Ethnological Research Centre and National Museums Scotland, 2007) (phew! ), there is a very good chapter by Stuart Eydmann, ‘Diversity and diversification in Scottish music’. Eydman gives as a subtitle ‘Sketches for a Scottish musical-historical map’, and then gives a couple of pages in turn to a half-century or so, starting with “before 1840”, and then progressing, “1840-1900”, “1900-1945” and “post 1945”. Of course it is the “1900 to 1945” section that is most relevant to the Scottish 78rpm gramophone records, though the late 19th century observations are useful as well. Eydman deals clearly and concisely with the different types of musical activities which different parts of society took part in, including domestic performance on instruments, both working class and ‘bourgeois’, as well as the music hall, one of the most important contexts for the gramophone records. 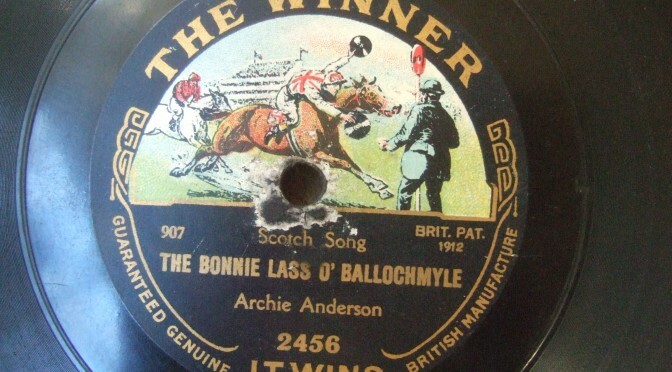 It seems to me that there were two different backgrounds from which musicians would come forward to produce a gramophone record of “Scottish music” in the teens, twenties and thirties: music hall performers, and “concert artists”, i.e. classical musicians. Harry Lauder is of course the best known music hall artist performing “scots songs”, and on the disc of his I have he is very much playing up all of the negative racial slurs of the Scotsman as a foolish, drunken, untrustworthy figure of fun. 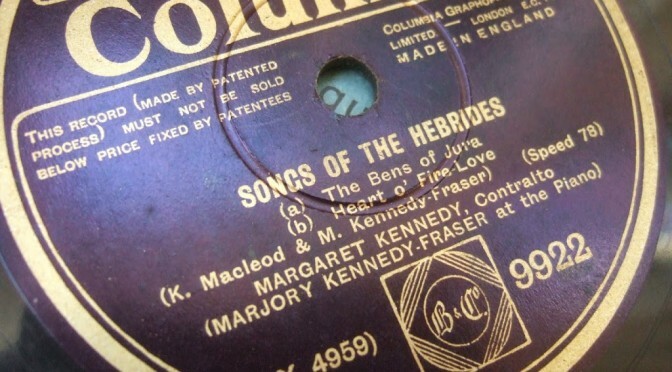 Both on this disc and on another, a record of Jock Mills from 1914, there is a similar vocal style, with slighty hysterical-sounding swoops down onto certain stressed notes, and a very curious extended rolled R in the middle or end of many words – I’m not aware of this sound as a part of any Scottish dialect and I assume it is a music-hall comic convention. Marjory Kennedy-Fraser is the best known “concert artist” in this field. 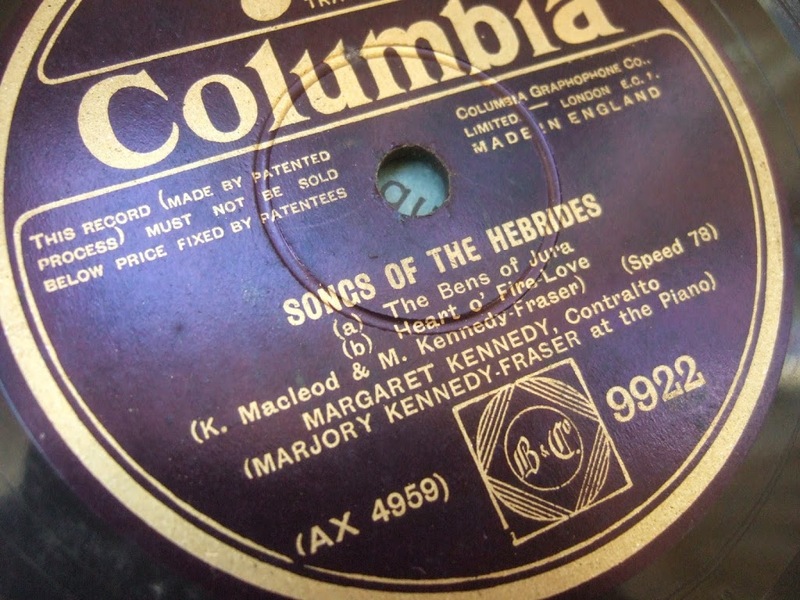 Her “Songs of the Hebrides”, ostensibly arrangements of traditional Gaelic songs, but in reality pretty much newly-composed pastiches, were very popular, and many classical singers specialised in them, such as Joseph Hislop (I have a 1933 disc of him). But other classical musicians turned to what we would consider genuine traditional material, and performed it in a pretty interesting straight classical style, such as Archie Anderson singing “Jock O’Hazeldean” (Walter Scott’s tidying up of a traditional border ballad) in 1914, or Kenneth MacRae singing “Òran Mòr Mhic Leoid” (a Gaelic song composed in the 1690s by Rory Dall Morrison) in 1931. The text is straight, the accompaniment is simple, and the vocal style is the classical norm of its time. David McCallum was a leading violinist with the Edinburgh symphony orchestras, and you can hear his classical learning on his record (c.1929) with its extensive slow portamento sliding, but he has a lot of very distinctive Scottish fiddle ornaments as well – this is not just a straight classical performance of the tune, such as we hear today from players like Jordi Savall. McCallum very much has a foot in both camps. I almost said if indeed there were two camps then but of course there were, and we can hear the other “traditional” style on the archive recordings. But the old traditional fiddlers would never have made a gramophone record in the 1920s or 30s! John MacDonald of Inverness on the pipes, playing “Lament for the Children” in 1927, does fit into this model, but perhaps not as obviously as first seems. Obviously he is not a “music hall performer” or indeed a “concert artist” in the classical sense, but his playing style, and the Pìobaireachd Society score he is working from, represent the height of high modernism, to the point that the traditional tune is barely identifiable in his extremely mannered playing. records, but they are before the big changes in style and presentation which quality recordings drove forward. I also read Susan Motherway’s paper ‘Mediated music? 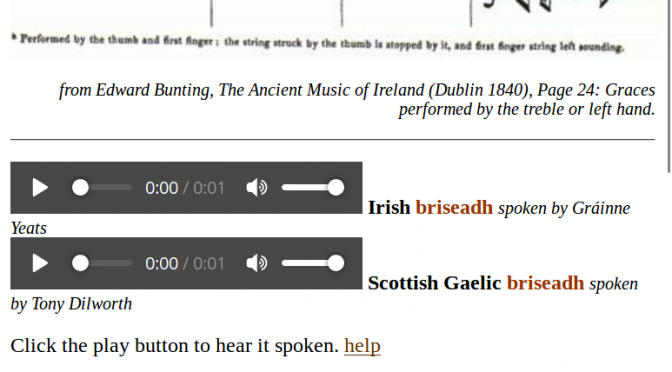 the impact of recording on Irish traditional song performance’ in the interesting collection Ancestral imprints: Histories of Irish traditional music and dance ed. Thérèse Smith (Cork 2012). Apart from the rather silly pomo writing style of the title and introductary paragraphs, this is a very insightful article that considers commercial recordings of traditional singers from the 1990s on. Apart from the good comments about the way in which different recordings place themselves very differently in the market, I was most struck by the comments about the amount of control that recording and sound engineers now have over the sound and the music of the singers. It almost seemed reading this article that similar issues dealt with by Phillips for classical music in the 1920s and 30s, are currently playing out in traditional music. Perhaps these things are always playing out to some extent, but I am fascinated by that constant tension between the musician as a performance artist, standing in front of or even better alongside an audience of their peers, and presenting a musical performance as a personal interaction, saying something to the listeners; and the recording as a product, a manufactured good, that is to be kept on a shelf and admired as an artefact. In six months time I have agreed to present a rather different programme for the Friends of Wighton – half an hour of ’20s sounds from old Scottish 78rpm gramophone records. It will be Wednesday 1st October, 1.15pm, in the Wighton Centre, Dundee Central Library. I realised that I have plenty enough discs for half an hour – just one side of each from a selection will be more than enough. We will have Gaelic song, Scots song, fiddle, pipes and clarsach; the oldest disc is from about 1914 and the most recent from 1931. Mabel’s record is Irish harp music but she wasn’t Irish or living in Ireland, so I wondered what was the oldest Irish harp record? Was Mabel first? Actually it seems she was. Susan Reed appears to have been the next to record, and her “Old English Folk Songs” released in 1945 would be the earliest published recording of Irish harp, even though the performer is American and the repertory is English! Mary O’Hara put out her first disc in 1956 I think. I’m having trouble tracking down other Irish harpists on record from this era. I have finally acquired a copy of archive recording of tautirut playing from 1958 held by the Canadian Museum of History in Gatineau, Quebec. Tautirut is the Inuit word for the bowed harp or box zither played in the area around northern Quebec and southern Baffin Island. It has strong connections to other bowed-harp traditions in Scandinavia and further afield. For more on the wider bowed-harp and bowed-lyre traditions I have made a bowed-harp web page. The collector Asen Balikci was visiting Povungnituk in Quebec in 1958, and he seems to have commissioned the people there to make a couple of “reconstructions” of the tautirut. I assume the “reconstructions” were necessary because the tradition was moribund there by that date. Cariola, then 38 years old, played tunes on the newly made instruments. Balikci recorded her playing and took the instruments and the tape recordings back to the Museum. The instruments are similar to each other; each has three sinew strings. The bow is strung with a willow root. They have only one bridge, so the strings must be fingered where they come off the soundboard, not into the air as on the Icelandic Fiðla and earlier Tautirut. Krenoourak’s instrument looks better; it is longer (though still not as long and slender in shape as the late 19th and early 20th century instruments), and it includes two little bits of wood which are now separate but which I presume are connected to tuning the instrument. These things have no tuning pegs; the strings are just attached to the ends, or in Krenoourak’s case, to leather straps attached to the end. Peterussie’s instrument is extremely short and fat, but it does have an ivory nut at each end where the strings pass over the ends. Cariola’s playing is very interesting, fast and obviously improvised. She uses different tunings; in the earlier tracks she has the instrument tuned with the drone a 4th below the melody note; in later tracks the drone is dropped to an octave below the melody note. I am particularly interested in the track that sounds like a trumpet fanfare, with the melody on 1st, 3rd, half-sharp 4th and 5th of the scale, with the octave bass drone. Her intonation drifts; sometimes it is clean and deliberate, while at other times it is rather wayward. Her instrument is tuned higher than Sarah Airo’s (see my earlier post) but the general style of playing and the sound is similar. Cariola seems to use the drone more sparingly, touching it at the same time as playing the stressed melody notes, whereas Sarah is more often alternating between the melody and drone strings so the drone becomes a rythmic part of the tune. I wonder about this being a woman’s music, and about the style – it does seem to be connected to other bowed-harp styles from Scandinavia. And the players were 200 miles apart – though perhaps that is not very far in Northern Quebec. Now to listen and learn some of the motifs and playing techniques! Last week and this week and next week the theme for my Saturday afternoon harp class in Dundee is Christmas music. Early this morning I suddenly decided that the wren song tradition would be a fun thing to do today – I have worked on Bunting’s 1809 setting of the Wren song before with a student, so I knew it was a great tune to give the class. But I also wanted to work on the traditions behind the wren hunt and so I had a quick look round to remind myself. Fintan Vallely’s Companion to Irish Traditional Music has a nice little article on the wren, with a lovely photo of wren boys in Dingle – I would guess the photo was pre-WW2, one of the boys has a fife and two have bodhrans (which gave me a chance to talk about that!). The article also included one verse of the wren song, which fits Bunting’s tune pretty well. I checked in Donal O’Sullivan’s notes on the Bunting tunes, and he does go into a lot of detail on the wren hunt but I did not spend too much time following up his references this morning. Looking online I got a couple of excellent references. 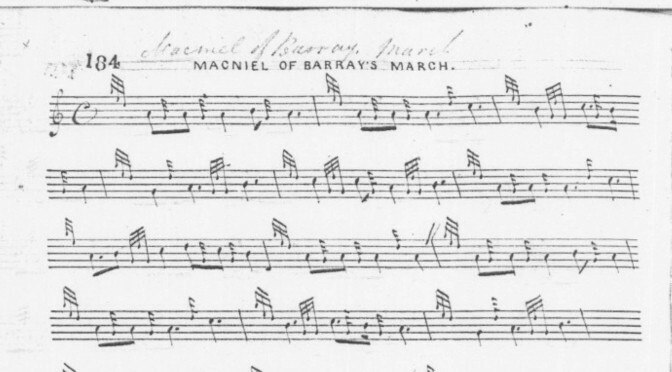 I got the pointer of the cutty wren song in Herd’s Scots Songs of 1776 – google books provided me with facsimile pages and all of a sudden I remembered that I knew this song from 20 years back, so I walked round the house trying to remember how it went. Every so often a whole new section of the question and answer would pop back into my head. In the class I managed to sing it and some of them even joined in with the answer sections – great fun, and not often that I sing an old song dragged up out of the back of my mind like that. But the most fun was seeing a reference to Liam Clancy’s 1953 recording of the wren song on the LP, The Lark in the Morning. I have a copy of this LP which I had for some reason never got round to playing much so I had the fun of finding the record, setting up the equipment and listening to his lively version of the wren. This is another song I know from way back (I have it on an old cassette tape of traditional British and Irish midwinter songs), and I was amused to hear him mentioning the town where he lived and also his mother by name in the song. Of course this evening as the gear was out and the record propped up against the bookcase I sat down on the floor and listened to both sides. What a beautiful and moving set of performances. At times I laughed out loud, and at other times there was a tear in my eye.